It may or may not feel like it yet where you live, but I'm sure you don't need to be told that summer is nearing its last days. After a long, hot season, many of us are ready for cooler weather, colorful leaves, hay mazes, and apple picking. It can be fun to bring some of that fall flair into your home decor, too. So whether you want just a touch of fall decor, or want to kick summer to the curb and go all in with your fall decorations, we have tons of ideas for ways to turn your home into a celebration of autumn. Fall decor is all about decorating with the things that are unique to the season. When I think about fall decor, the first things that come to mind are natural elements like dried leaves, pumpkins, acorns, apples, pinecones, and seasonal flowers like mums in warm reds, creams, and oranges. Although I make it a yearly fall tradition to read this piece about the return of decorative gourd season (warning: extremely unsuitable for those offended by cursing! ), there's no denying that gourds can really set the fall scene. Complete your decorative gourd displays with straw, wheat, corn, lanterns, candles, plaid, and burlap. Since Halloween is a subset of fall decor, and it's easy to get burned-out on that holiday, in this case I'm going to ignore it for more general autumn decorating ideas that can take you all the way through the season. Keep most of the same fall decor, but add and subtract bats, skeletons, ghosts, and spiders as Halloween comes and goes. Once you have your fall decor, after Labor Day is generally fair game for putting it up. If it's still a million degrees in early September where you live, though, you may want to wait until it feels a bit more like fall to decorate. But you've got a few months until it's time to switch for Christmas, since most people hold off on Christmas decor until after Thanksgiving. Although fall doesn't officially begin until the autumn equinox (September 22 in 2018), many craft stores start stocking fall decor in mid-summer, generally after the 4th of July. Big retailers like Target tend to roll out the decorative gourds and Halloween decor online in early August. By early September, store shelves are usually full of fall goodies that are starting to go on sale. But if that's not early enough for you, I can tell you from experience that if you need to buy fall accessories like fake pumpkins in the off-season, Amazon has you covered even in March. This is especially useful for anyone planning ahead for an event like a fall wedding. If you want to get ahead and save on next year's fall decorations, the trick is to stock up at the end of the season. The closer we get to Halloween and Thanksgiving, the steeper the discounts get, but the chances you'll miss out on your favorite items go up, too. Since they need to get a jump on the next season, craft stores like Michaels and Joann are usually the first to discount their seasonal merchandise, and most send out mailers or have apps where you can sign up for generous discounts. For long-term savings, stock up on reusable faux pumpkins and gourds during the end of season sales. 1. Sometimes less is more, as is the case with these small but beautiful matching flower urns. 2. A window box is an easy way to add some autumnal flair. 3. Pumpkins, cornstalks and a square red wreath give this gorgeous home the feeling of fall. 4. Sick of red and orange? Cover your traditional fall items with a coat of white paint! 5. This window box has a subtle feeling of autumn with white pumpkins and maroon chrysanthemums. 6. This plain cement staircase is lined with classy white pumpkins, floating candles and gourds. So pretty! 7. Try adding magenta-colored mums to the mix for an unexpected twist. 8. Put your mums in baskets and add some dried grasses for a seaside look. 9. Winter cabbage and ferns surround an inviting rocking chair on this front porch. 10. Carry your fall decor all the way down your front steps. 11. Dried cornstalks, plus matching leaves, apples, flowers, and corn, really evoke a rustic country spirit for fall. 12. There's no rule that you can't go neutral with your fall decor. Painting pumpkins, real or faux, is a great way to create a unified color palette. 1. This understated wreath has a unique look, but uses materials that are super easy to find. Here is the tutorial. 2. This "candy corn" wreath is super cute... check out the tutorial here. 3. For a simple, more rustic fall wreath, try using dried wheat. Here are the instructions. 4. Use up your yarn scraps for this cute one... read more about the project here. 5. Metallics give the front door some glamour... check out the tutorial for this one here. 6. This yarn pumpkin wreath is pretty darn cute - and easy to make too. Head over here for the instructions. 7. And these felt flower wreath couldn't be easier to make - find out how here. 8. This colorful pumpkin wreath proves that you don't have to limit your fall decor to stereotypical fall colors. The full Curbly tutorial is here. The best part is that you can make it completely your own, and use whatever colors work for your decor! 9. This stunning fall wreath from Michaels also eschews traditional fall colors. Get it here. Indoors, even if you don't have time to create autumn vignettes and centerpieces (life is busy! ), adding cozy throws, pillows, and candles can go a long way in amping up the seasonal feeling. Plaid, faux fur, chunky knits, felt, leather, and velvet are all perfect for fall home decor. 1. Make an affordable faux fur pouf with this Curbly tutorial. 2. Don't have room for a whole pouf? This faux leather and faux fur pillow gets you a similar look, but you can toss it on your couch. Get the how-to here. 3. Stay cozy with this flannel throw blanket. Sew your own with the instructions here. 4. If you're more of a shopper than a maker, you can buy this cozy cotton plaid throw here. 1. To recreate this look, line up candles in a wood crate or box, then pile pinecones, leaves, decorative berries, gourds and pumpkins around the candles. 2. Learn how to make this fall leaf and fruit centerpiece here. 3. 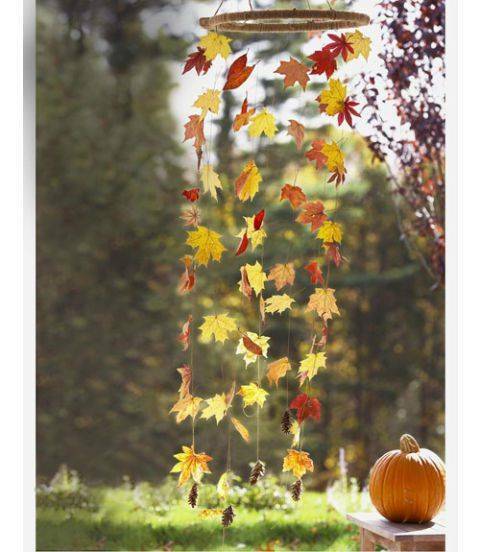 This DIY autumn mobile would look great hung over the dinner table. Get the instructions at Oh Happy Day. 4. If you're ready to make your own fall flower bouquet, but you're not quite sure where to start, here are step-by-step instructions for three different displays. 5. Warm metallic accents are a great element to add to your fall decor. One of the above bouquets would look gorgeous in a copper-wrapped vase. The five-minute DIY is here. 6. Add a twinkle to your tabletop with these DIY copper leaf candles. 7. These DIY gilded chargers and dishes are another way to add metallics to your tabletop. 8. Sew your own faux leather leaf table runner with this Curbly tutorial. 9. Convert a pumpkin into a pretty vase, and fill it with fresh flowers for a pretty tabletop fall centerpiece. Get more details here. 10. This gilded leaf centerpiece would make a lovely addition to a Thanksgiving tabletop. Get the full how-to here. 1. Real or faux fall leaves plus fairy lights are an inexpensive way to bring the beauty of nature indoors. Get the tutorial from Wallflower Kitchen. 2. This oak leaf and acorn garland from Terrain would be a gorgeous addition to a fall mantel. Buy it here. 3. Make your own fall leaf garland out of felt with these instructions. 4. This dried corn garland sounds super easy to make, and would look great on a fireplace mantel. Get the full instructions here. 1. 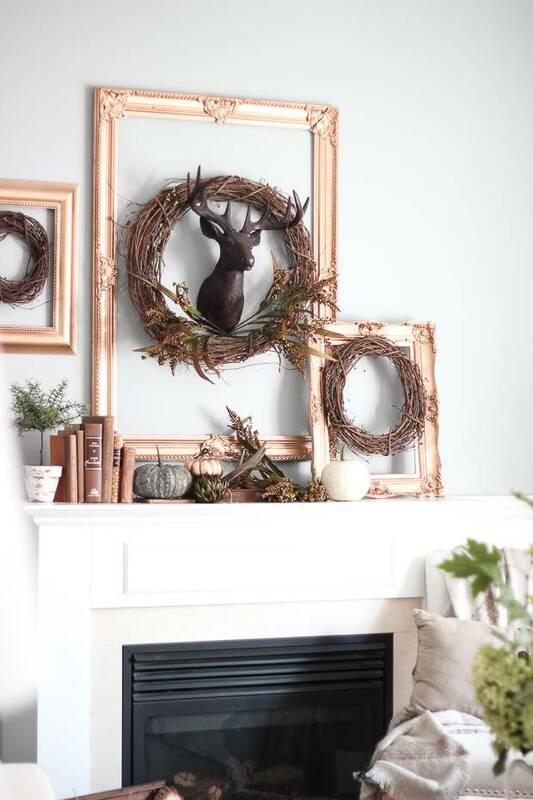 Framed wreaths add a unique bit of character to this mantel with a neutral palette. Read more about it here. 2. Wild eucalyptus and white pumpkins lend a Scandinavian feel to this simple mantel. Check it out over on Instagram. 3. If you prefer more of a cottage vibe, try this elegant approach with florals and gilded accents. Check it out here. 4. Unique heirloom pumpkins and pretty feathers give this mantel lots of character. Read all about it here. 5. For a more traditional take, try using reds, oranges and golds. 6. 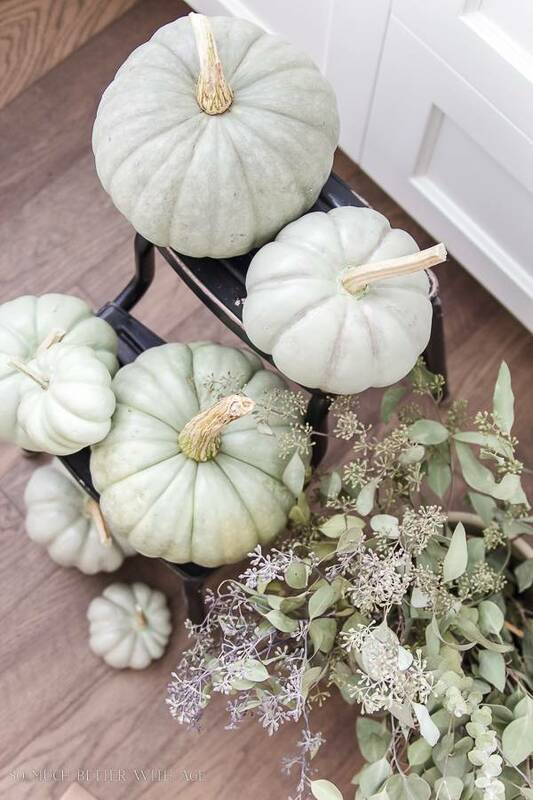 For a muted color scheme, try seeded eucalyptus and light colored heirloom pumpkins. Check out the whole look here. 7. Dried wheat is another fun fall accent that looks great on the mantel. Check out this setup here. 8. Dark browns and golds give this mantel a deep, rustic effect. See it here. 9. 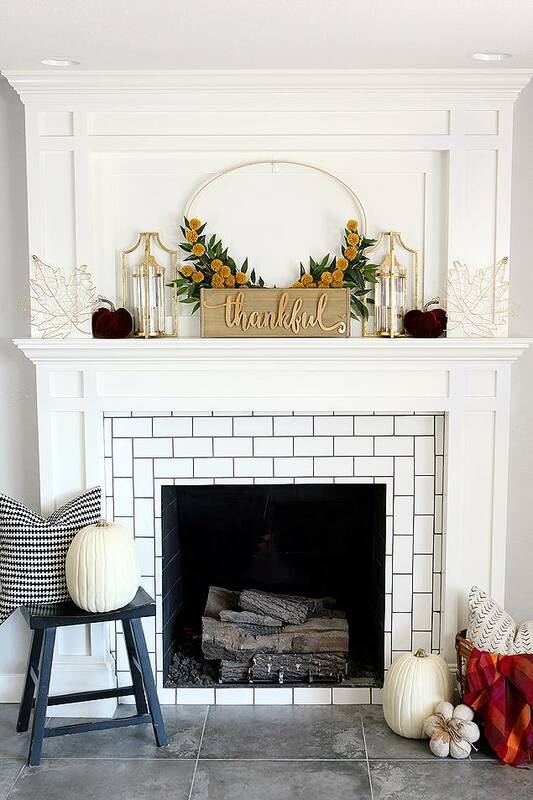 A mix of beautiful typography and pretty gold accents makes this mantel one of my all-time favorites. Read more about it here. 10. And for something completely unique, add some serious color to your mantel! Check out how Kara did it here. If you're a fall decorator on a budget, Mother Nature is here to help. You can forage a lot of the essential elements of diy fall decor for free even if you don't have your own yard. Dried leaves, grasses, seed pods, and twigs are often just laying around in parks and in public right-of-ways, and as long as you don't damage any plants, no one should mind if you collect a few natural elements. Supplement your foraged pieces with inexpensive grocery store flowers in fall colors. 1. If you plan ahead, next year you could even grow your own decorative gourds. For this year, though, you can find lots of inexpensive fall decor at dollar stores, thrift stores, discount stores, and grocery stores and farmer's markets. These are especially great resources to combine with some crafty skills to make your own cheap diy fall decor. A little paint can go a long way in helping inexpensive autumn decorations look more classy and cohesive. 2. Apples make cute seasonal taper candle or tealight holders. Little Green Notebook has the instructions for turning apples into centerpiece-worthy tealight holders. 3. Brown glass bottles, free if you drink beer, root beer or aren't shy about raiding recycling bins, make atmospheric vases for fall flowers. 4. Learn how to paint cheap plastic dollar store pumpkins to make them look like heirloom pumpkins with this how-to from So Much Better With Age. You can even take it a step further and use white glue to create a crackle effect, with these instructions. 5. Give an old tray a makeover with chalkboard paint and fall foliage. 6. Glue leaves to glass jars from your recycling bins for pretty fall candles. See the full instructions at Spark & Chemistry. Fall-themed weddings, birthdays, and baby showers are a fun opportunity to showcase fall decor. And there's no reason you can't steal some of the same ideas for your Thanksgiving tabletop or general fall decorating. 1. This elegant fall-themed baby shower from Sugar and Charm has lots of pretty fall decorating ideas. 2. A DIY caramel-apple bar would be delicious at any fall event. If caramel apples don't appeal to you, there are lots of other options: seasonal fruit pies (apple and pumpkin! ), donuts, apple cider, or s'mores. 3. This leaf mobile would look lovely at a fall event. Get the easy instructions here. 4. 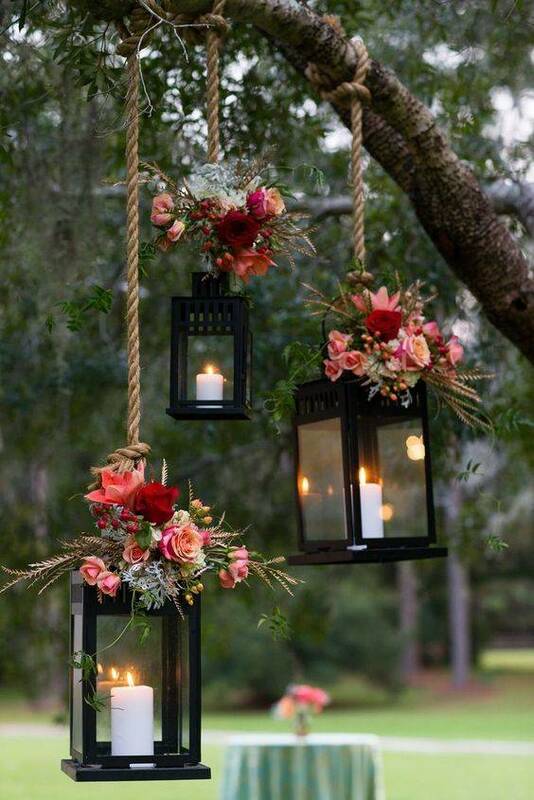 Hang flower-bedecked lanterns like these for cozy lighting at your autumn event. Share these fall decor ideas on Pinterest! So, what are your decorating plans for this fall season? Leave us a comment and let us know! I'm a DIYer/writer/photographer who loves power tools, great design, and making messes. I share my many projects at my blog DIYinPDX.com.